Measure all the ingredients into a mixing bowl, except the boiling water. I don’t normally sieve things, but I would sieve in the cocoa powder and brown sugar as they tend to be a bit lumpy. Whisk everything together until smooth, then slowly whisk in the boiling water. The mixture will now be quite runny, so transfer to a jug and carefully pour the batter into the paper cases until about two-thirds full. Bake in the oven for 15 minutes, or until risen and the tops are springy to the touch. Remove from the oven and set aside to cool for a few minutes. Transfer from the tray to a cooling rack and leave to cool completely. Reduce the oven to 120C. Break the chocolate up into small pieces and drizzle with a tiny bit of vegetable oil. Mix everything together with your hands. Bake in the oven for 10 minutes. Remove the tray from the oven and spread out the molten chocolate. Repeat this process of cooking in 10 minute batches and re-spreading, until the chocolate has turned a deep golden-brown. Don’t be tempted to skimp on this part, the longer the white chocolate bakes, the more pronounced the caramel flavour. It usually takes about 60 minutes for me. Scrape the caramelized chocolate into a bowl, stir in a small pinch of salt and set aside to cool. Meanwhile, beat the butter until soft and fluffy, then carefully stir in the icing sugar. 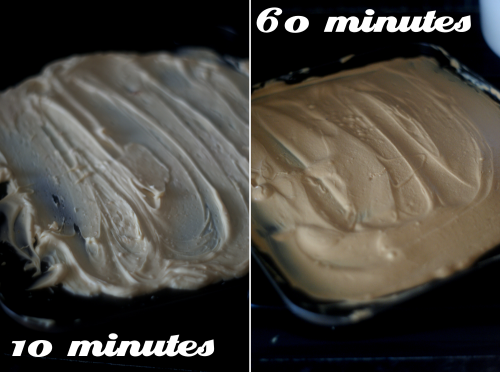 Beat for another few minutes or until pale and fluffy. Beat in the cooled white chocolate. You can either transfer the icing to a piping bag and pipe the icing onto the cupcakes or spread it on with a pallet knife. 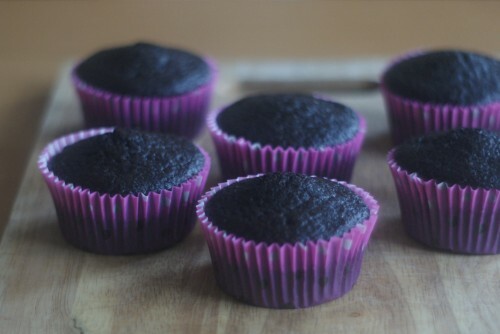 Note: These cakes are really moist, so will keep happily for a couple of days in a tupperware. Wow, they sound fabulous! 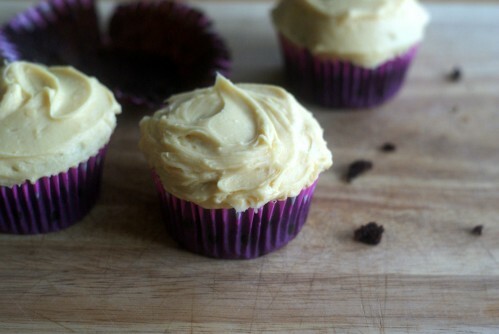 I love the idea of caramelised white chocolate, and in combination with those gorgeous dark looking moist chocolate cupcakes sounds like my idea of heaven! I’m really curious about caramelised white chocolate! I adore chocolate though I’m not a fan of the albeno variety (too cloying, as you say) so this could be a great use for it. Exactly. I have to admit, I used value white chocolate for these cupcakes and they still tasted delicious! If you like ice cream, I would really recommend the ice cream too. Well, they didn’t keep for a couple of days, they were so delicious we ate them all! Slightly scary recipe, but resulted in the most amazing sponge and there are no words to describe the icing – just chocolate heaven! Yes, they are amazing aren’t they? You need to make the ice cream next – it is unbelievable.